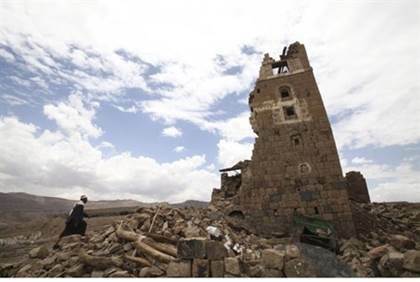 UNESCO on Friday condemned the destruction of ancient houses described as a “jewel” of Islamic urban landscape in an alleged Saudi-led air strike on the Yemeni capital’s old quarter that killed five people, AFP reports. The incident occurred before Yemen’s warring factions are to meet Sunday for UN-sponsored talks in Geneva. The coalition led by Riyadh denied claims that it had carried out an air strike in Sanaa, suggesting instead that a rebel munitions cache may have exploded, according to AFP. Residents of the quarter said a pre-dawn strike was the first direct hit there since the launch of the campaign against Iranian-backed Houthi rebels in late March. A missile hit the Qassimi neighborhood without exploding, but killed five residents, including a woman and a child, and destroyed three three-story houses, medics and witnesses said. She said she was “shocked by the images of these magnificent many-storied tower-houses and serene gardens reduced to rubble. “The historic value and memories enshrined in these sites have been irreparably damaged or destroyed,” added Bokova. “This destruction will only exacerbate the humanitarian situation and I reiterate my call to all parties to respect and protect cultural heritage in Yemen,” she said. A Saudi Arabian-led alliance began launching airstrikes on the Houthi rebels on March 26, aimed at restoring exiled Yemeni President Abed Rabbo Mansour Hadi, who fled Yemen earlier this year to seek refuge in Riyadh as the militia captured parts of the country. In addition to damages to heritage sites in Yemen, UNESCO has also been vocal in its condemnations of the destruction of sites in Iraq by the Islamic State (ISIS) group.